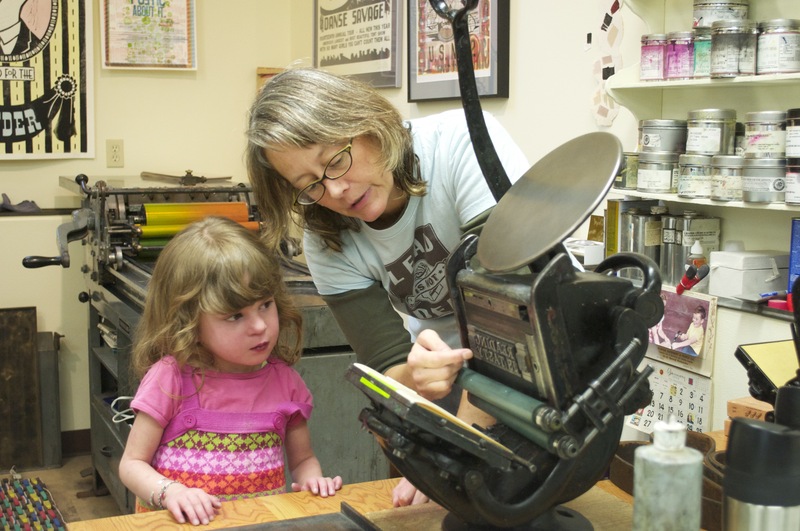 Jessica Spring shows a young visitor how the press works. Are you a professional artist that lives in Tacoma and/or has a working studio in Tacoma? Do you want to open your studio to the public, demonstrate how you make your work, host a hands-on activity, and help raise the visibility of the arts in Tacoma? Apply to participate in our 12th annual Tacoma Studio Tour! The Tacoma Arts Commission is seeking professional artists who are willing to open their studios to the public for the Tacoma Studio Tour, one of the features of Art at Work: Tacoma Arts Month this November. The emphasis of this tour is on raising visibility of the arts and providing artistic opportunities for the community to connect to the arts. While we encourage artists to have work for sale, the intention is not primarily as a studio sale. Studios will be open on Saturday, November 2 and Sunday, November 3 from 11 am to 5 pm. Artists can choose to be open on Saturday, Sunday, or both days. The Tacoma Arts Commission will produce extensive electronic publicity materials including email newsletters, blog posts, and an interactive website and map. We will also produce a printed brochure for the Tacoma Studio Tour. The studio tours are free to both the artists and visitors. A private entity is working on plans to provide a bus tour of studio locations. Studio Tour artists will have the opportunity to opt-in to being a stop along the bus tour route for a fee. More information about this optional service will be provided to all Studio Tour artists later this summer. Deadline for submissions is Monday, July 22, 2013, midnight. Applicants will be juried in a competitive process by a sub-committee of the Tacoma Arts Commission and selected based on the quality of artwork and the overall diversity of the work presented, as well as geographic diversity of the studios. If you would like to be a guest at another studio, the above guidelines still apply. A studio is defined as a location where artwork is created on a consistent basis. Go to www.surveymonkey.com/s/2013TST and fill out the online application form. Please submit the following two items by email to tacoma.submissions@cityoftacoma.org with the words “Studio Tour_Your Last Name” in the subject line. Digital images only. Original work and slides cannot be accepted. We will use the images in materials produced for Art at Work month. • File Format Submit only “High” quality JPEG files (do not use GIF, TIFF, or other formats.) Do not embed the images into PowerPoint or submit moving image or audio files. • Image Size Images must be at least 300 ppi resolution. Images smaller than 600 pixels per side are not recommended. Based on overwhelmingly supportive feedback we received from the community, Art at Work Month will be moving to October in 2014. Not this year. Next year. We’ll have more information for you when we get closer. Spaceworks Tacoma and Downtown On The Go (DOTG) are teaming up to facilitate new Artscapes for the building walls at 11th and Market in downtown Tacoma. We are seeking artist(s), artist teams and/or community groups to transform the current “Chalk Walls” into temporary 2-dimensional, site-specific installations (Artscapes) with a theme of transportation. Artists are asked to submit proposals that will create a space that adds to the livability of downtown and positively reflects living, moving, or being downtown Tacoma. The building is located at 953 Market Street, Tacoma, WA98402. There are 15 wood panels total ranging in size from 150 SF to 400 SF. The Artscapes will be up for a period of 6 months and the artist will assume maintenance of the installations. Please submit proposals for all or part of the panels being offered with special attention paid to excluding the brick areas that are not currently painted green. This project offers a stipend of $2,000 total (for materials, artists’ time and maintenance) for all panels located on 11th and on Market Streets. Applicants can propose to create an Artscape on only one side of the building, i.e. 11th street OR Market Street, for a stipend of $1000 per street side. Understand that initial payment is made within 30 days after installation, upon receipt of an invoice, and that payments cannot be made until contracts have been fully processed. A portion of payment is retained until deinstallation is complete. Selection Criteria: Artists will be selected based on the following criteria. Applications to the Spaceworks program are reviewed by a panel of artists, arts professionals, Spaceworks Steering Committee members, representatives of neighborhood groups, and/or commercial property owners. 5-10 digital images that demonstrate the artist’s past work. Whenever possible, include images of similar past projects. Artists applying as a team who have no examples of joint work in the past should submit 5 images of each artist’s work. o File Format: Submit only “High” quality JPEG files (do not use GIF, TIFF, or other formats.) Do not embed the images into PowerPoint or submit moving image or audio files. o Image Size: Images must be atleast 72 ppi resolution and 1000 pixels max on the largest side. o File Labeling: Files must be titled with the applicant’s name followed by a number indicating the viewing order. Use a “0” in front of single digit numbers and use only letters, numbers, and underscores. For example: Smith_01.jpg; Smith_02.jpg. If using Mac OS 8 or later, be sure to include a “.jpg” extension at the end of each image title. o File Upload: In the application, please upload your images in the order to be viewed. o Please provide the exact web address(es) where the online videos can be viewed. The panel will view a minimum of 1 minute and a maximum of 3 minutes of each video. Save as PDF. File should be 1 MB or less. Ready to apply? Click here to go to the online application. We suggest you gather all your materials before starting the application. If you have problems with the online application please contact Gabriel Brown, Spaceworks Arts & Economic Development Intern 253.682.1735, GabrielB@tacomachamber.org.